In partnership with Shell Puget Sound Refinery, this video demonstrates one of the facets of programs available at the Boys & Girls Club. Last summer, Puget Sound Energy demonstrated power safety with a miniature display of power lines using real electricity. Skagit Fisheries Enhancement Group brought in water quality testing kits and the kids got a hands-on experience with testing streams for salmon habitat. Shell Puget Sound refinery brought in a mini-refinery to show how fuel is processed. Additionally, youth traveled beyond the Club, visiting State parks, aquariums, art museums, and toured local businesses, By working with other businesses and non-profits we are able to expand our Club member’s world and show them some of the possibilities for their #GreatFutures! Our Clubs are part of the community, and the community is integral to the success of our organization. Every Club member who walks through a Club door, who is greeted by friendly & supportive staff, and who receives the mentoring necessary to pursue greater opportunities is part of the neighborhoods, towns, cities, and community of Skagit County. Partners make the work possible. Partners ensure that Clubs have the support, and the resources necessary, to reach those youth who need us most. Since 1997, the Boys & Girls Clubs have been building great futures for our youth, and that’s only possible because of the partners who stand as Champions. When you reflect on what makes a community great, and what has helped this community in Skagit County to thrive, think about the role partners have played in the development, growth, and flourishing of the Boys & Girls Clubs. Great Futures Start Here, because we have partners who make it all possible. Above, one our Partnerships between another nonprofit organization, Skagit Friendship House, the Clubs, & Draper Valley farms. 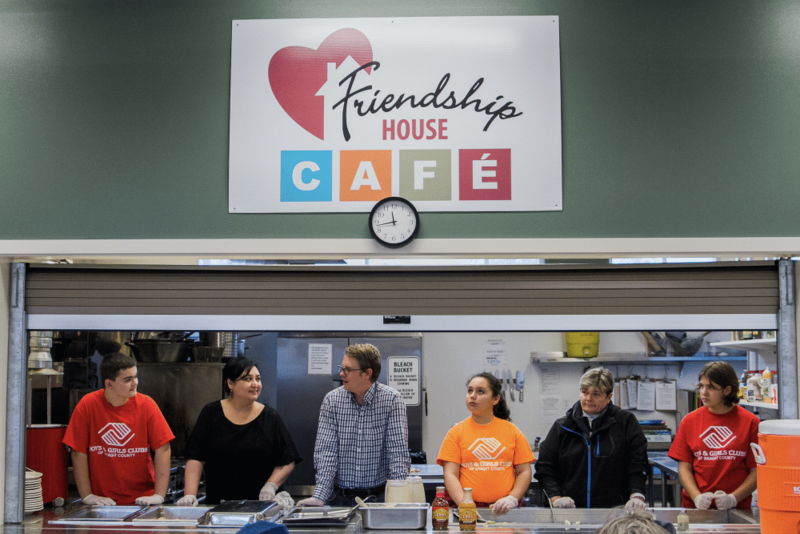 Club youth, along with Draper Valley employees, volunteered to serve food at the Friendship house cafe, with the food provided by Draper Valley. Investing in Boys & Girls Clubs results in benefits to local communities. In addition to receiving marketing recognition, employers who invest in the Clubs realize the benefits through increased productivity, reduced delinquency, and most importantly, an educated future workforce. Whether it’s help underwriting an event or the delivery of programming, corporate partners help drive the Clubs' mission by connecting us to the community. We also work with local companies to bring their industry into our Clubs to inspire Members to think about their future career. If your company operates in Skagit County, we would love to partner with you. Partnering with other Non-Profit Organizations allows us to pool resources and maximize the capacity of all parties to fulfill their missions and improve our community. Whether by pass-through of federated fundraising campaigns, or working in tandem to deliver services to the community we live in and love, teaming with other NPOs in Skagit County to improve our common ways of life makes a big impact. In-Kind donations of labor and/or materials allow us to accomplish specific projects that benefit or facilitate program delivery. A clean-up or site improvement project, a gift of office supplies, or an item donated for a fundraising raffle or auction, are all examples of In-Kind donations we have received in the past. There are countless more ways to support the Clubs through material support; get in touch and we’ll be happy to discuss any opportunity with you. Philanthropic giving is visionary: people want to invest their hard-earned money in an organization that not only makes an impact, but leaves a legacy that aligns with their vision. Restricted gifts can make a huge impact in a specific and controlled way. Unrestricted gifts require trust in an organization’s leadership, but allow for the kind of visionary flexibility necessary to keep up with the changing needs of the Club Members we serve. Grant funding comes in many forms: foundations, government programs, or corporate citizenship just to name a few. We receive support from community partners locally and nationally whose philanthropic objectives see them wanting to give back to the communities in which they operate. Our mission focuses on youth safety and development, but also has elements of wrap-around family support, economic and community development, healthy food systems, and environmental stewardship. If you know of a grant opportunity that aligns with our mission, we would love to hear about it! Sponsoring a fundraising event is a great way to get involved with Boys & Girls Clubs. We hold four large, county-wide events each year, and other smaller events to directly support Clubhouses. We offer opportunities to sponsor these events at several levels with increasing recognition. Since our fundraising events are opportunities for us to engage with our community directly, sponsorships help underwrite the cost so that all proceeds raised can be invested directly into program delivery. If you’re not sure how to start engaging with the Clubs, sponsor a Special Event! Get in touch and we’ll give you the details. Many companies operating in Skagit County offer programs to match employee donations. From large, multi-national corporations to small, locally owned and operated businesses, if your employer provides volunteer incentive programs, chances are good that they also match financial contributions to non-profit organizations like us. If you’re not sure about your employer’s policies, check with your HR department, or give us a call and we will help you find out if your company matches volunteer hours or financial contributions. We love this community, and we love that there are people so invested in making it better that they would work to create better opportunities for our kids. We want to see that continue. Our kids benefited from great opportunities, and we want great opportunities be available to more kids. This is the best option that we see for so many kids, and for so many families. It’s living out a dream for great futures. Life can be a challenge in the best of circumstances. Not every child is provided the support and opportunity to navigate successfully through the challenges of youth. This is why we support the Boys & Girls Club of Skagit County. They consistently impact the lives of local youth providing opportunity and hope for their adult success. This is a win-win – it benefits the youth and contributes to making this community a better place to live. We consider our partnership with the organization a good investment in the future of Skagit youth. Thank you Boys & Girls Club Staff – we appreciate all you do! We LOVE getting involved in our community. That's why we were so excited to hang out with the Boys & Girls Club in Mount Vernon! We learned about watersheds and our impact, played games and did a short art project!